toilet, combination tub/shower, Bathtub with sea view. This is a small paradise on earth & we had such a nice week there. The house comes with all the comfort you need. The view on the little harbour & the sea is breathtaking...So, we would love to come back! Thanks Dominique. La vue est magnifique, petits ports et petites criques sont au pied de la maison et Marseille n'est qu'à une vingtaine de kilomètres. Quartier typique, sans trop de touristes ! Nous avons passé une très bonne semaine dans cette villa. Les enfants ont bien apprécié la piscine. Nous avons découvert les environs, dont une grotte, en canoé. Nous avons été très bien accueillis par Sandra et Nico qui nous ont fait visiter la maison et donné beaucoup d'explications sur les balades à faire et autres renseignements. Nous reviendrons avec plaisir. Maison atypique avec une superbe vue. Nous avons passé un très agréable séjour et profité un maximum de la terrasse. We arrived on 9th of June to follow the national team of Iceland in football for the euro competition, and we stayed for 12 days. Nice people welcomed us and showed us everything in the house. The house is very cozy and you can find everything you need. The toilets are a little bit different then we are used to but we just found that funny :). There is no air condition and sometimes we were a bit hot during the night (especially in the upper bunk bed), but we are from Iceland and used to the cold so maybe it doesn't count ;). The view from the house was so beautiful and the location was perfect, around 20-30 minutes from Marseille by car (you definitely need to have private car). The woman who owns the place also drove us around the next day after we arrived and showed us the train station, grocery stores, pharmacy etc - very helpful. The terrace was very nice and we spent a lot of time in the pool to cool off and enjoy the sun. We also drove by the coast to next small towns and they had very nice sand beaches (especially the one in Carro - La Couronne Plage). One thing that we found a bit uncomfortable was the fact that the contract that we signed was in French and we couldn't understand it, but the woman tried her best to translate for us. There also was a book in the house for useful information about the house which also was in French. But they said that they were planning on translating everything to English soon. I think that maybe they haven't been renting the house to foreigners very often, just other French people. There also was a black cat that was always trying to get inside. Maybe he lives there, we don't know. One morning we woke up with him in our bed, he had come inside a open window. But he was very kind and we sometimes fed him outside. Hope we'll see you next year. endroit magique de par la situation de cette maison restée dans son jus, endroit paisible, ressourçant et baigné de soleil! voiture conseillée car à pied, tout est loin; le train, ne proposant aucun retour tardif au delà de 20H, les virées nocturnes sur Marseille sont improbables! De L'Estaque, acheminement vers Marseille possible grâce au train, au bus ou à la navette maritime. maison très complètement équipée, que ce soit à l'intérieur comme à l'extérieur. Très beaux souvenirs de vacances entre amis normands. 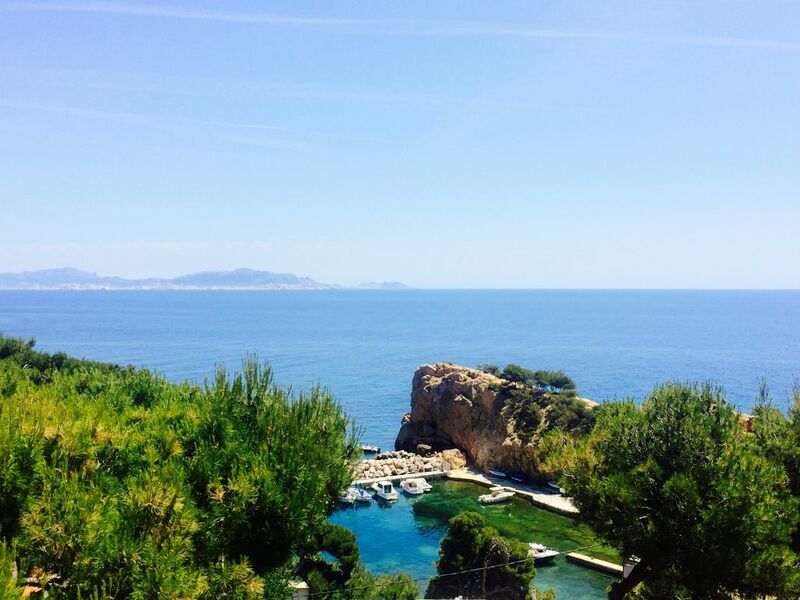 You will be staying 2 minutes away on foot from the sea and the calanque (rocky inlet). The house overlooks the Madrague de Gignac (former tuna net fishing harbour) in Ensuès-la-Redonne. 150€ supplémentaires facturés pour le ménage de la villa en fin de séjour sauf si fait par les locataires. Lors de la réservation, les locataires devront parafer et signer un contrat de location établi par la propriétaire et fournir une attestation de villégiature délivrée par leur assurance de responsabilité civile.